A court has recognized the right of ownership Saleema of family land, where a local entrepreneur was building luxury resorts. Her legal battle cost her 300 thousand rupees (2 thousand euros). She will be compensated with 5 million rupees. Local activists: "Her example gives strength and courage to those who risk losing their land." Kalpitiya (AsiaNews) - After seven months of hearings and 300 thousand rupees (about 2 thousand euros) spent on lawyers, a Muslim woman from Kalpitiya (North Western Province) has won her battle against a local businessman of luxury resorts. A court has in fact recognized Seinulabdheen Saleema, a married mother of two children, the right of ownership of two plots of land of coconut trees, on which Neil Silva had begun construction of 80 villas for his company Dutch Bay Resorts. For more than a year fishermen and inhabitants of the islands of Kalpitiya have been protesting against the mega tourism project involving the local beaches. To kick-start the country's economy, the government has in fact initiated a series of programs to promote luxury tourism, however, that risk of damaging the ecosystem and the survival of local communities. "Seven months ago - Saleema tells AsiaNews - I noticed that the workers of Neil de Silva had invaded my property, they were building a huge hotel. I explained to them that those lands belong to me, but de Silva told me that he bought the area from another person. So, he would not let me enter that area. " Saleema’s is not an isolated case. Government and private investors invade land belonging to other people. They fence them, put them for sale or rent and then prevent the real owners from entering. Saleema did not lose heart: "I have owned that land for 30 years: 12 acres are mine, inherited from my grandmother; 14 acres by my mother, she left me to manage them. I took the ownership documents and went to court, determined to take back what was mine. After 14 hearings (two months), the court ordered Neil de Silva to stop work. " Since the building had been completed, she explains, "I asked for a compensation of 5 million rupees (about 34 thousand euros) from the entrepreneur." The man agreed to the request and said he will pay "the value of the property." In these seven months, local media and the National Fisheries Solidarity Movement (nafs) have defended the woman. "I have to thank them - she says - for encouraging me not to lose hope and guiding me in this battle." 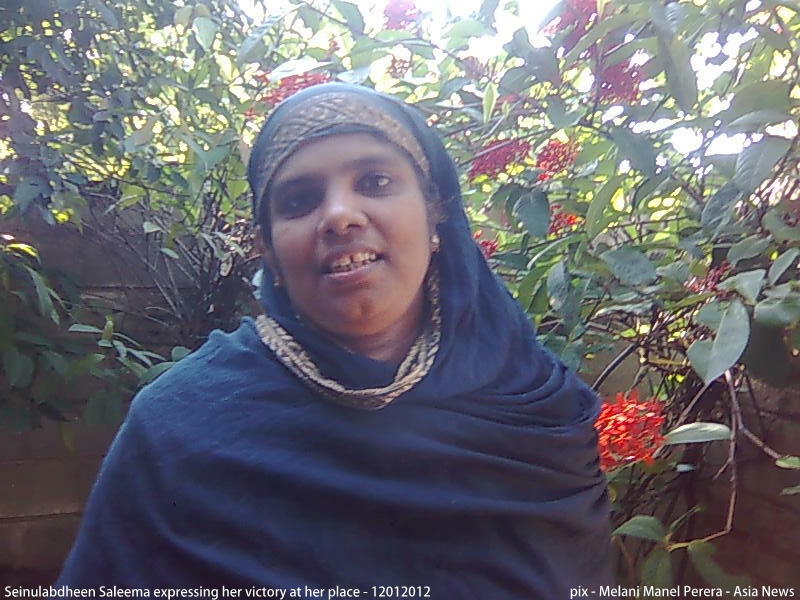 Saleema's husband said he was "proud" to have such a courageous wife. "In Kalpitiya - Herman Kumara president of Praja Abhilsha Network and convener of the People's Alliance for Right to Land told AsiaNews, - there are hundreds of people like Saleema who have lost their land. This victory gives courage and strength to those people who want to fight against the major investors. "